A]s we settle into the new year, I am sensing big change. Not as in small change, like a new haircut, but a global shift. And it’s coming from all directions. As an energy worker and healer, I am particularly sensitive to shift. And because I have lived on both coasts of the United States (as well as a few places in between), I’ve collected wonderful friends from all over. The advent of social media is a profound gift for someone like me. It has helped me weave a treasured tapestry of friendships that I can enjoy all in one place. No surprise I was an early adopter of social media for this very reason. Without it, some of those friends I love (but somehow fell through the cracks), have returned to me like the soft spurs of a dandelion that — once blown into the wind — float back and gently kiss my face. I am noticing this shift in the posts and updates I see from friends and strangers alike. The men are getting more emotionally expressive and sensitive; the women more humorous and relaxed. The flow of humanity, for me, is reflecting a consciousness shifting itself into a deeper space of self-reflection, self-awareness. We have found a perfect, permanent coffee shop, filled will only our very own favorite besties. And it’s open 24/7, for a quick ‘thinking of you,’ or maybe an unexpected middle of the night profound conversation. It has the wonderful, soothing effect of giving us the sense that maybe, just maybe, we are all not so terribly alone. So I marvel at it all, knowing that all is well. That no matter what you or I may be experiencing in this moment — good, bad or indifferent — there are no worries because it will all change in the blink of an eye. Change is the only constant. 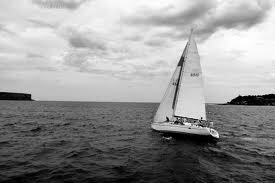 And since the winds of change are always going to blow, you might as well build a sailboat.